Easier said than done, of course. Sweets just taste so good. There’s a reason for this. We crave sweets, like we crave fat and salt, because the taste represented a scarce and valuable commodity to our ancestors. And since, thousands of years ago, our ancestors hardly ran the risk of getting too much of these things, our taste buds and our brains were programmed to seek out as much as we could get. Mills also sees an emotional, evocative element in our craving for sweetness: “Sweetness must really be equated with nourishment; it is the quality of a simple agrarian diet, and it has its most potent metaphor in mother’s milk.” No wonder we want that cookie. Anyways, that’s it for the philosophy. Now, on to the science. I want to cover three basic concepts. And then, finally, we’ll get on to the sweeteners themselves. The glycemic index is a way of rating foods based on how much they’ll spike a person’s blood sugar. To call a food high-glycemic is to say that it spikes blood sugar severely. A low-glycemic food, on the other hand, barely spikes blood sugar at all. The reference value for the Glycemic Index is white sugar, which scores a “perfect” 100. So if something scores an 80, for example, it spikes blood sugar about 80% as much as white sugar, etc. When you eat something high-glycemic together with something low-glycemic, the numbers sort of “average out.” You see, fat, protein, and fiber all take a while to process, and as the stomach and small intestine are processing them, the sugar has to wait. This is why ice cream (with fat and protein) is lower-glycemic than sugar. It’s why fruit (with the fiber intact) is so much lower-glycemic than fruit juice. Concept #2: Revenge of the Hypothalamus! The idea here is that you can trick your taste buds, but you can’t trick the deep structures of the brain. So let’s say you eat something sweet, but non-caloric. The taste buds tell the brain it’s going to receive a nice sugary payload, but then it doesn’t. So your subconscious tries to send you to the cookie jar to collect what it was promised. To be fair, the research here is still in its infancy, and has mostly focused on people who drink bucketloads of diet soda. It’s too early to jump to any conclusions about “normal” people who eat and drink “normal” amounts of these sweeteners. But if we’re going to jump to those conclusions anyways (and I am! ), it should call into question, not just the artificials, but non-caloric herbal sweeteners too. I believe we could sidestep this issue by using non-caloric sweeteners in foods with at least some other nutritional substance, for example protein drinks. Or drinking our diet sodas with a meal. Sugar absorbs water, interacts with heat, caramelizes, gets sticky. 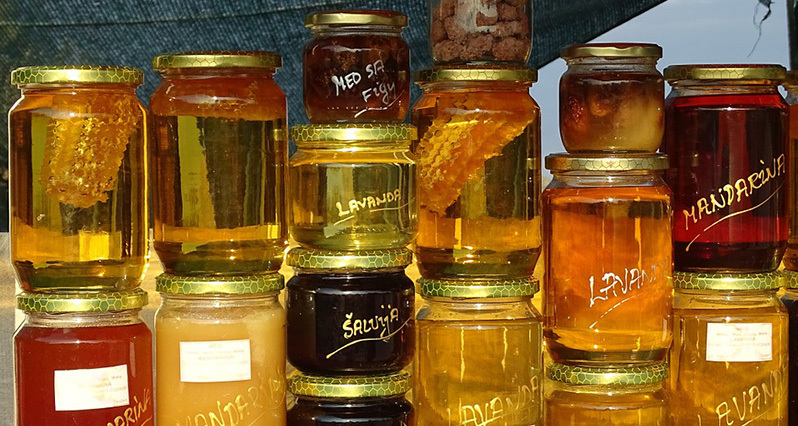 Honey holds moisture, holds ingredients together, acts as a preservative. All traditional sweeteners add more to a recipe than just sweetness. They add texture. Non-caloric sweeteners, on the other hand, whether they’re artificial or herbal, only add sweetness. Some of the sweeteners on this list can be substituted for sugar in recipes. I’ll point them out. This is the only artificial sweetener that I can’t find any scientific reason to distrust, or dislike. So I’m going to cite my grandma, instead, who “just [didn’t] trust them or like them.” So far, history has proved her right on just about everything else…. Still, if I had to use an artificial sweetener this is the one I’d feel most comfortable (i.e. “least uncomfortable”) with. Agave is a plant that looks like a giant aloe vera; it’s the same plant used to make tequila. Agave nectar is made by breaking down the complex carbohydrates in agave sap into their component sugars. This can be done either with heat, or by digestive enzymes. The resulting product is liquid, sweet, and lower-glycemic than many sweeteners. If the complex carbs aren’t broken down too far, the nectar may still contain substantial amounts of the prebiotic fiber, inulin, which feeds our healthy probiotic bacteria. Agave is versatile, without any strong distinctive flavor. And if it’s processed with enzymes instead of heat, it’s suitable for raw food diets. Agave hit the market big-time about five years ago. Almost overnight it was everywhere. Stores like ours gave it the green light because it is relatively natural and better than many of the alternatives. However, some unscrupulous marketers took it too far, claiming it was guilt-free sweetener, that we could have our cake and eat it too. Of course it’s not a guilt-free sweetener. Nothing is. And there’s been a pretty vicious backlash recently, as a number of self-proclaimed “health crusaders” have taken it upon themselves to expose the “shocking truth” about “toxic” agave. The actual truth, of course, falls somewhere between the extremes. The crusaders claim that agave isn’t “natural” because it’s made with “chemicals.” This is nonsense: the “chemicals” (if they’re used instead of heat) are digestive enzymes. The crusaders also assert that agave nectar is “high-fructose” like high-fructose corn syrup. This is true. Then again, grape juice and apple juice are also high in fructose. Actually, fructose levels in agave nectar vary. I’ve seen it clock in anywhere from 40% fructose, to upwards of 90%, depending on how far the breakdown of the starches is allowed to proceed. However, fructose levels aren’t the whole story. Compared to high-fructose corn syrup, which hardly contains any other solids except ultra-high-glycemic glucose, the rest of agave will be composed mostly of the prebiotic fibers mentioned above. Finally, the crusaders claim that some agave nectar is cut with cheaper sweeteners, and much of the supply labeled “raw” may in fact be secretly heated. I have no idea what to say to this. Certainly, there will always be people willing to lie to make a buck. But I tend to trust the people we deal with. Most of the research suggests that drinking the occasional aspartame-sweetened soft drink does not pose a significant health risk. I agree. That being said, there is reason to believe that long-term, frequent consumption may be neurotoxic and possibly addictive. Aspartame is not used in baked goods, since it degrades when heated. is about half as sweet as sugar. Its thickness and gooey-ness make it ideal for “sticky treats” like popcorn balls and puffed rice bars. The first step in making barley malt is to sprout barley. Sprouting produces enzymes which break the grain’s starches down into sugars, which normally feed the growing barley plant. Instead, the barley is quickly roasted at a temperature high enough to kill the plant, but not so high as to destroy the enzymes. The seeds are then slow-cooked in water so that enzymes have plenty of time to develope more and more of the sugars. The resulting malted barley can be dried into malt powder, or bottled as malt syrup. Or watered down, and allowed to ferment into beer. It has a pleasant, grainy, mildly earthy flavor I enjoy. Barley malt is a combination of the sugars maltose, glucose, sucrose, and fructose ? all high-glycemic. I’d always been told barley malt was a low-glycemic sweetener… a lot of references still say it is. However, based on its composition, I’m finding that increasingly hard to believe. This is one of my very favorite sweeteners. Made from tapping the nectar of coconut palm flowers, and then boiling it down, it’s like a tropical version of maple sugar. Only it tastes subtly of caramel, and can replace white sugar 1:1 in recipes. It’s also very low-glycemic for a sweetener, scoring in the mid-30s on the Glycemic Index. It has a respectable mineral content. And its harvest, if not truly sustainable, comes a lot closer than most other sweeteners. Palm trees also produce coconuts. They don’t need to be cut down and re-planted every year. I want to reiterate: there’s no concentrated sweetness we can consume in vast amounts with impunity. Coconut sugar might be as close as we can get. And it is among the most delicious of the bunch. It’s just about the only sugar we use in our baked goods. This is just dates, dried and powdered. It might not have any of the “special” benefits of other sweeteners, but it’s about as low-glycemic, raw, and unrefined as you can get. Not everything tastes good with that date flavor (for example, I wouldn’t want it on my strawberries) (actually, I don’t want any sweetener on my strawberries! ), but some things taste extra-good. For example a caramel-y nut brownie, or maybe a carrot cake. A raw chocolatier called Stirs the Soul has started making a date sugar-sweetened dark bar, which is, frankly, exceptional. From his book, Out of the Earth. Sadly out of print, it remains perhaps my favorite “advanced introduction” to herbal medicine.